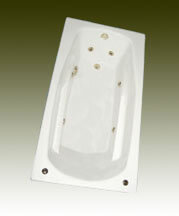 The Pro-Fit 3660 is a rectangular jetted bathtub with 6 powerful Ultra-Swirl jets and integral armrests. This whirlpool provides a larger bathing well for 5-ft. installations. 59.75" x 35.75" x 21.75"